Looking for a delicious, high protein, low carb after-workout or anytime shake? 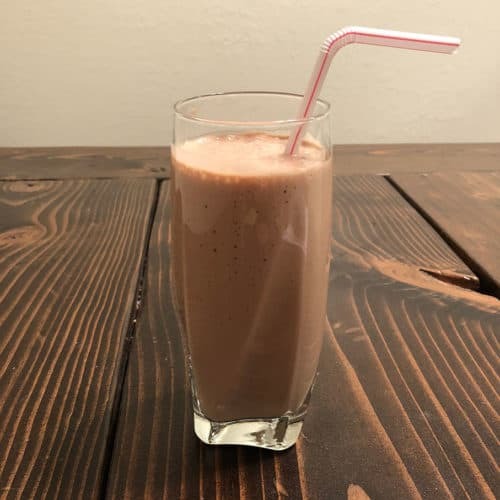 Here’s a simple tasty chocolate peanut butter protein shake recipe that fits your keto or low carb diet! I’ve been making this chocolate peanut butter protein shake as a post-workout meal or snack for years. It’s quick, absolutely delicious, and really satisfying. The shake is packed with the stuff you need after a workout (protein to repair and build muscle) and won’t put the weight back on with a bunch of worthless carbs. Making the shake takes only a minute and requires just 5 ingredients. Do it! Blend all ingredients together in a blender on low or medium setting until smooth (add the almond milk to the blender first, if you do the powder first it as a tendency to get stuck down in the bottom and not all blend in with the shake). Should take about 30 seconds to 1 minute. That’s it. In just a minute you’ve got a great tasting post-workout drink or quick meal-replacement to refuel you. Enjoy.